“What Memories Will You Create This Christmas?” – is the question raised in the Christmas advert released by Virgin Experience Days. 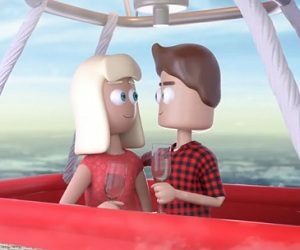 The animated spot features a couple who decide to give the loved one an experience day instead of giving objects. Thus, they will remain with unforgettable memories, some of them immortalized into photos placed in frames. He gets to feel like a Formula One champion for a moment, thanks to the gift received by his better half, and she feels happy enjoying a brunch with him before taking off into the air with an air balloon, where they have a glass of champagne. The song used in the ad is “Adventurers” by Holley Maher.